This home may qualify for lease purchase option thru Home Partners of America. Once you step into this light filled Rutenberg 'St Tropez', you will know that this is it. 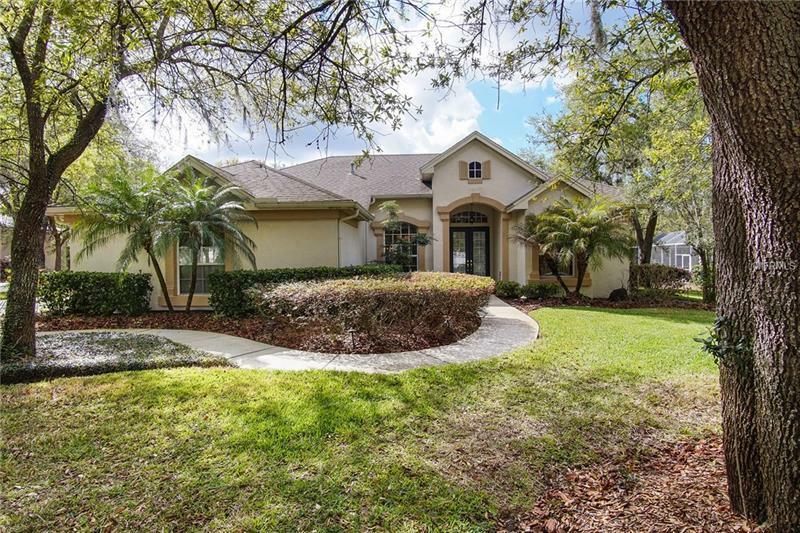 Sitting on almost 3/4 acre conservation, cul-de-sac street w/ private wooded view in the gated, guarded 24/7 community of Fish Hawk Trails. As you step inside, you will notice the elegant details, such as tile insets in foyer & master, diagonally laid tile thru-out all living areas, crown molding, coffered ceilings & niches. Wooded views & the sparkling pool are captured from all living areas. Well laid out 3 way split floor plan w/ spacious master privately located on one side of the home w/ double french doors, conservation view & access to the pool area. Luxurious spa like master bath w/ dual sinks, make up vanity, garden tub, separate shower & pocket slider to bath for privacy. The kitchen boasts quality wood cabinets w/ off setting crown, granite, stainless appliances, natural gas cook top, breakfast bar & butlers pantry. The family room has built in shelving & opens to the pool & full outdoor kitchen w/ natural gas grill & green egg smoker. Bonus room that can be used as 4th bed/office. Other features include a whole house generator, well for irrigation providing $$ savings to water bill, high end ceiling fans, water softener, bose speakers in all living areas, master & pool area (stereo equipment conveys), security system & greenhouse w/ sprinkler system. Located in well sought Fish Hawk w/ great schools & amenities. See it today! !